Occasionally, just occasionally this job is a 24 carat pleasure. We present to you Tij, one of the finest cats we’ve had the good fortune to review. We don’t have tangible examples of agility, but we know that Tij is adept at catching birds. Obviously birds live in the sky so any cat would require a degree of agility to get up there. Unfortunately predatory ability is covered in another category and it would be remiss of us to double count. We do know that if you were to hold your hand above her head she leaps like a coiled spring looking to be tickled. We are aware that the spring metaphor fails towards the end. She’s a very good weight. What else do you need to know? We’re not going into exact details, anyway, you’ve got no idea how big she is so telling you how much she weighs would be practically useless. All you need to know is she weighs less than the other cats, all of them. In itself she is lucky to be a good weight. Tij and her brother were rescued from a precarious life behind some large bins. Tij falls down here. We’ve seen no evidence that she visits upon other houses. As we’ve gained an insight into Tij’s life we’ve come to the conclusion that her spectacularly comfortable home life has dulled her instinct to explore. How can you describe Tij other than chatty? She enters into proper full on conversations with her owner. Of course these are the illusion of conversation, we can’t communicate with cats on any level beyond the need for eating and tickling. Even suggestions around impending danger are generally suspect if you’ve got them from a cat. She can take down a bird on the wing (we might have assumed this bit). Tij is so adept at this that she has turned the systematic destruction of lesser species into a full time job. Everyday, out there just killing. But that’s not to say that Tij hasn’t achieved balance in her life. After a busy day slaughtering she likes to come home and curl up for a cuddle. Birds and mice are one thing but clearly the challenge of other cats is a greater order of magnitude, not for Tij, she takes them all on. She grew up on the street protecting her brother from all the menaces you would expect to find behind a large bin. Tij is cute and that’s beyond dispute. Whether she is sporting a delightful pink scarf or just lying about, she’s a picture of cuteness. She also appreciates the finer points of looking good. After Tij has been outside stopping the bird population getting out of control she likes to settle down for “salon time” which is apparently a long standing arrangement she has reached with her owner where she gets mercilessly groomed (we believe that is based on the more traditional meaning of the word). We recognise that she has formed a close bond with her owner but we haven’t seen many indications that she is putting in much effort with the rest of the human population. All cats need room for improvement and this is clearly an area that Tij needs to work on. 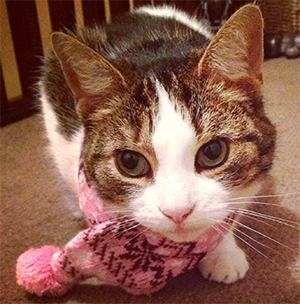 Whilst it is definitely cute to see a cat wearing a scarf it really doesn’t do much to enhance their dignity. Come on Tij, you’re a cat, so it gets a bit cold out there, just deal with it. On the one hand it seems that Tij has extracted the most privileged of lives from her grateful owners but on the other hand she seems inclined to throw it all away. Her owner has reported that at night Tij likes to sleep on her face (her owners face not Tij’s face, that would be impossible). Whilst this has been interpreted as endearing it could be an attempted smothering. We hope there’s nothing in it, but if Tij is living out some dangerous vengeance fantasy where she destroys everything she ever loved, then that’s not going to end well. She was rescued from the RSPCA (admittedly in the scheme of things the RSPCA don’t usually pose a great danger to cats, unless they’re getting all gassy), she’s lived behind a bin (large), lost her brother in sad circumstances and found a loving home where she bullies other cats. It’s like the perfect story isn’t it? We love Tij, she is just the blend of cute and dangerous.